My new book, One Size Fits All: How to Wear God’s Word is finally here! Next Wednesday, August 1st we will be having a Birthday Party for the book. 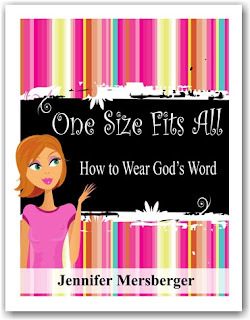 I invite you to go to www.amazon.com anytime throughout the day and order a copy...but not until next week! I will be using a large portion of the proceeds to donate a class set of books to local organizations ministering to women who are homeless or in jail. These women would not have the opportunity to do the study any other way, and they need to know God’s word applies to them as well. I am still making arrangements and praying over the organizations but will announce who the recipients are after the Birthday Party. For over a decade, I have served in women’s ministry in one capacity or another. And would you like to know what one thing most women all have in common? They don’t realize their value to God. God gave me a passion for helping women understand their value to Him. We are priceless. We are more important than anything else in God’s eyes. We are His treasure. What does any of this have to do with the new book? Everything! This new study is a perfect tool to show us how God intended us to live out His word. 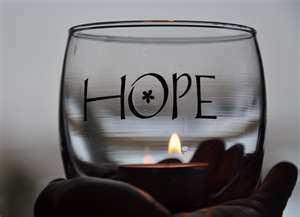 Every day we will explore a different parable as we Pick it Up, Put it On, and Walk it Out. God wants us to know that His word is relevant today. He gave us a living word because we are precious to Him—a priceless treasure. Please join me in expanding the Kingdom for Christ. It’s His plan and by His grace alone that I wrote the new book. Please help me use it for His glory! A few years ago, I bought a product to help with joint pain. I have a gimpy knee from an accident several years ago and was intrigued by the idea of pain free living. The product promised to alleviate pain and improve my range of motion. The catch was you had to allow it to build up in your system before you’d feel any relief. 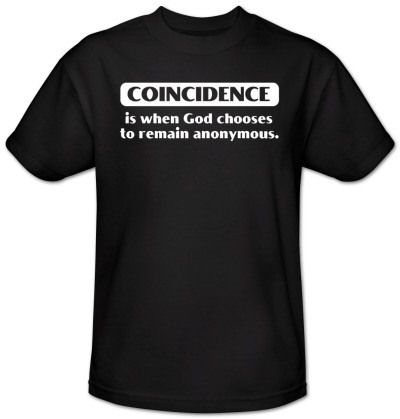 Do you believe in coincidence? Ever have certain things just line up the way you hoped they would? Are even the bad things turning out for your benefit? This was one of those mornings. The alarm clock sounded promptly at 6:00. Instead of hitting the snooze button, I accidentally turned it off. Coincidentally, my husband Greg had his alarm set for 6:45 so I still managed to leave for my meeting on time. My little red car twisted and turned down the back roads until I reached the highway. I came up to the traffic light I usually have to sit through… but not today. Like Moses parting the Red Sea, the light stayed green allowing me to go ahead of the long line of cars merging onto the highway. When the construction traffic brought the highway to a stop, I had the chance to take a different route to not sit in the gridlock. I just happened to see a new road that had opened up by coincidence. Because of the detour I even made it to the meeting on time. The truth is—there is no coincidence. Things line up and work out because God allows them to. The Creator of the heavens and the earth can move us forward or slow us down according to His plan for us. He opens doors of opportunity and closes doors of temptation. His hand gently guides our path, even when we don’t know He’s there. He uses every situation to grow us closer to Him. Sometime between 33-36AD, Jesus was crucified and died on the cross. This was a declaration against sin. In an act approved by God, Jesus took on the sin of a nation and died to free us from its’ stronghold. We were finally free to spend eternity with our Heavenly Father. A person doesn’t just claim eternal salvation; they have to accept the free gift. They follow the leadership of God and live by His laws (and grace). From that point on, they function as a new creation. On July 4, 1776 the Declaration of Independence was signed. The Declaration explained why the thirteen American colonies wanted independence from the British Empire. 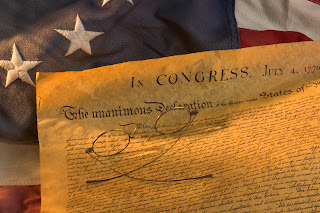 In an act approved by Congress, the United States of America was officially born. A nation doesn’t just claim its independence, it has to become independent. The thirteen colonies had to form new leadership and create governing laws. From that point on, they function as a new creation. July 4, 2012 we make our own declaration. This is a declaration from the stronghold of sin that has kept us captive for far too long. This is a declaration approved by Christ, because He died to free us from it so long ago. We don’t just claim independence, we have to become independent. God has equipped you and I through His leadership, the law of His Word, and by His generous grace. From this point on, we are a new creation. Believer, our freedom has been bought with the blood of the Lamb and protected by the blood of the fallen. But have you made a declaration of independence? Or are you still living under the authority of sin? We can’t just say we’re free; we have to walk in freedom. Are you ready to make your declaration of independence?